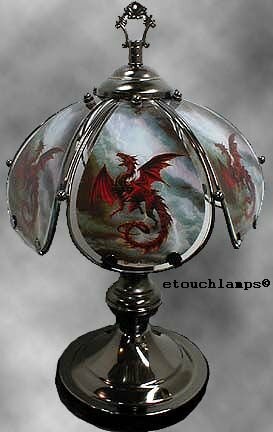 This is a new design of our 14 Inch lamps. The base has a Pewter-colored (dark gray) finish. Touching the base anywhere turns the lamp on and off and controls the 3 power settings. What makes this lamp so unique, however, is the shade. In a black metal framework are 6 panels of glass. Each panel has a picture of a large dragon. The diameter of the shade is approx. 9 inches so this is a great desk or nite lite. A 40-watt bulb is included.